Planning on going to the 2017 Chief Joseph Rally? 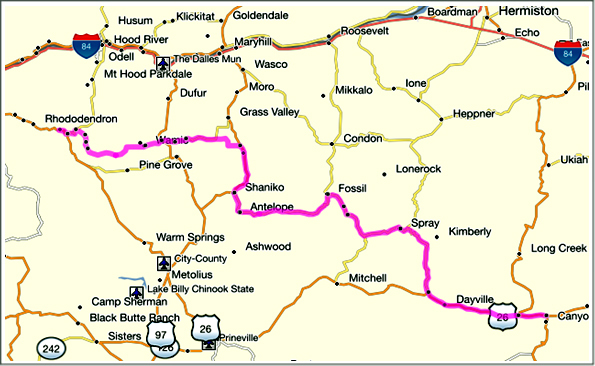 If you enter John Day into your GPS it will map a route on US 26 all the way - 209 miles and about 4 hours. Done that how many times? How about trying a different route? One that takes you off the boring busy highway and through some great Oregon back roads. Oregon is such a beautiful state with many incredible motorcycle roads. The “alternate route” described below is 237 miles, about 26 miles and 90 minutes longer but absolutely worth the extra miles and time. A route filled with scenic beauty, little traffic, and some great twisties. The alternate route starts just a few miles east of Government Camp off of Oregon 35. 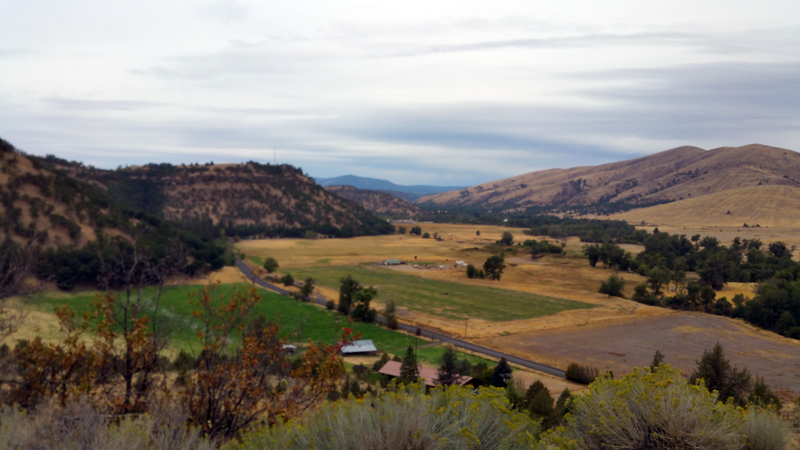 About 4.7 miles from the intersection of US 26 and OR 35 turn right onto USFS 48. 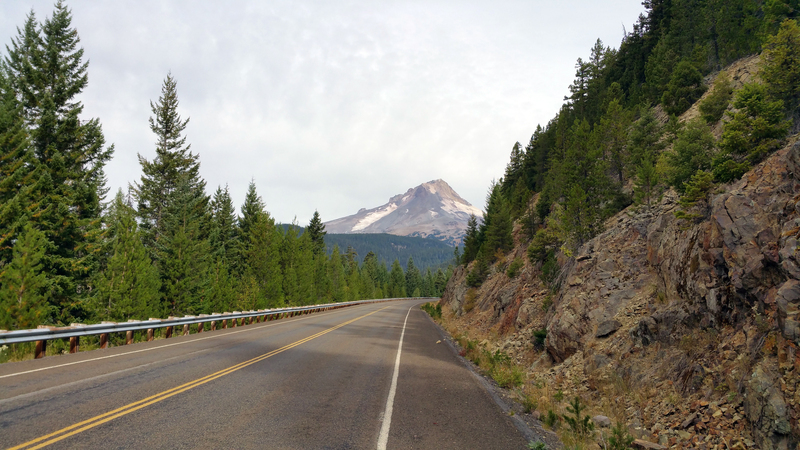 USFS 48 is a nice, two lane paved road through some splendid forest with some great views of Mt. Hood. You’ll either see Mt. Hood in your mirrors or you’ll have to stop to get a great view. USFS 48 will take you all the way to the scenic farm community of Wamic. On your way to Wamic you will notice the forest slowly change from deep fir forests to more open scrub country with oaks. If you’re on a GS there will be lots of tempting gravel side roads to explore. If you’re on a K, GT, or RT you’ll enjoy the little traffic and scenery. It’s 29.6 miles to Wamic. If you want to take a break, about 5.6 miles before you get to Wamic you can stop at beautiful Rock Creek Reservoir. In Wamic you’ll want to turn right onto the Wamic Market Road on your way to Tyghe Valley about 6 miles away. Before you get to Tyghe Valley you’ll get some great views of the hills and farms below in Tyghe Valley. Rather than turning right onto busy US 197 which will take you to Maupin, go across the highway onto Oregon 216. This is a great twisty remote gem of a motorcycle road that should not be missed. About 4 miles from the intersection of US 197 and OR 216 on your right is White River Falls State Park. It’s a good gravel road to the park but a great place to stretch your legs to walk and see the beautiful White River falls. OR 216 then drops down to the Deschutes River where the Deschutes River narrowly carves its way through the rock to only a few feet wide - very impressive sight. The road then snakes its way out of the Deschutes River canyon to wheat fields above and some beautiful rolling straight sections. Turn right (14.5 mi. from White River State Park) onto Ball Rd and then 6 miles later turn left onto Liberty Rd rather than following OR 216 farther north where it meets up with US 97. Next, turn right onto US 97 and travel the 18.5 miles to Shaiko where you can stop for an ice cream at Goldies Ice Cream Shoppe. Across the street from Goldies is another incredible motorcycle road - OR 218 - take it! The ride from the high plateau around Shaniko to Antelope is filled with exhilarating twisty-tight switchback curves - what fun! The lonely road from Antelope to Fossil is a roller coaster type of ride with little traffic. You’ll struggle between catching glimpses of the scenery around you and watching the road as it twists and turns. In no time you’ve traveled the 42 miles from Shaniko to Fossil. You can stop in Fossil - there’s services there, or turn right onto the John Day Highway, OR 19, and go on 7 miles and take a quick break at the cool and shady Bear Hollow County Park (drinking water & restrooms) or 3 miles further at Shelton Wayside. The next 25 miles to Spray will drop you down into John Day River canyon country. The scenery and road is fantastic. As you wind your way through the curves along the John Day River perhaps you may notice the “mystery.” Mysteriously the road seems to go downhill but the river seems to be flowing the opposite direction - “uphill.” How can that be? It takes a lot of concentration to focus on the many curves that wind along the river versus looking at the river. At Spray you can get refreshment and if needed get some gas (only Regular) at the Country Store. The next 31 miles to the intersection of the John Day Highway and US 26 continue to be some of the best motorcycle riding anywhere. Again the many twists and turns demand your attention away from the beautiful John Day River canyon scenery. Particularly as you approach the John Day Fossil Beds you catch glimpses of the colorful rock formations before being forced to focus on the curves immediately before you. You quickly realize you can’t do both - either enjoy the scenery or rip through the curves. A stop at the Thomas Condon Paleontology Center provides you with some mental and physical relief after swinging your ride through the corners. Besides that the fossils on display are pretty darn interesting. Who knew that camels and hippos once roamed the ancient John Day river area. The last 38 miles of US 26 to John Day you probably already know well. By now you’re probably thinking about where to set up your tent and who else you’ll see at the CJR. You’ll have your own stories to tell as you describe your scenic backroad twisty journey. Each year I go to the CJR I try and take a different route and always feel so richly rewarded with a great ride.